PHOENIX (January 10, 2018) – What happens when America’s former Toughest Sheriff joins the fray for a U.S. Senate seat in Arizona? The race for the GOP nomination gets thrown into disarray. A new poll conducted of 504 registered voters was conducted Tuesday by OH Predictive Insights (OHPI) shows U.S. Rep Martha McSally of Tucson is the new leader with 31 percent support. Former Maricopa County Sheriff Joe Arpaio, who announced this week his intention to seek the nomination, follows closely at 29 percent. Former State Sen. Kelli Ward now trails with 25 percent. 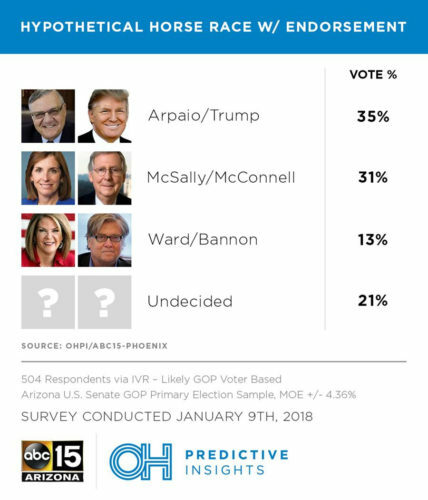 Arizona’s OH Predictive Insights and ABC15-Phoenix (OHPI/ABC-PHOENIX) teamed up to find out how the entrance of Arpaio changes the dynamics of the Senate election contest. OHPI conducted an IVR survey of 504 likely 2018 GOP Primary Election voters comprised of Republicans, Independents and Party Non-Declared statewide here in Arizona. The sample is based on voter history and qualified as a likely voter for the 2018 GOP Primary Election in this survey with a +/-4.36% margin of error. We first looked at where the candidates stack up in regards to their name ID, fav/unfav and net positive numbers. U.S. Rep. Martha McSally, of Tucson, leads the pack, however, all three are within the margin of error. She also is the least damaged of the group given she only has a 17% total unfavorable number, although, a third of voters don’t know who she is. Arpaio clocked in at an astounding 97% name ID and by almost a 2-1 margin he holds a positive view from likely GOP primary voters. A key indicator of a winning a campaign is not just being known, but being known AND liked so we ranked the list by the people with the highest net favorable name identification to lowest positive name ID. Now, let’s see how everyone stacks up in the horse race question if the election were held today. 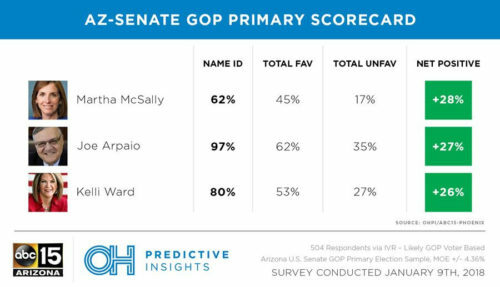 Back in November, OH Predictive Insights polled the horse race with just McSally and Ward. Ward was in first place with 42% and McSally trailed by 8 points at 34% with 24% undecided. 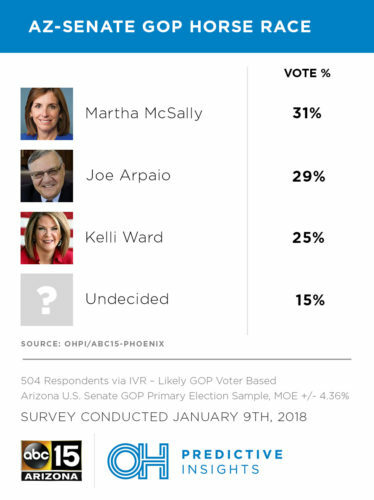 With Arpaio entering the race McSally goes from second to first and Ward goes from first to last place with only 15% of voters remaining undecided. Where did the votes go? McSally only dropped 3 points from the previous poll, which is within the margin of error. Arpaio’s entrance did not affect her. Ward on the other hand lost 17 points, which migrated over to Arpaio. Arpaio also pulled 9points of the undecideds off the board, which now leaves just 15% of voter’s undecided in this contest. Now, we will take a look at how a Trump, Bannon or McConnell endorsement would impact GOP voters for this race. A Trump endorsement makes a huge difference, with 73% of voters saying his endorsement is a significant influencer in their decision. And by more than 2-1, Trump moved voters in a positive direction. McConnell only moves 57% although in the wrong direction by 8 points. 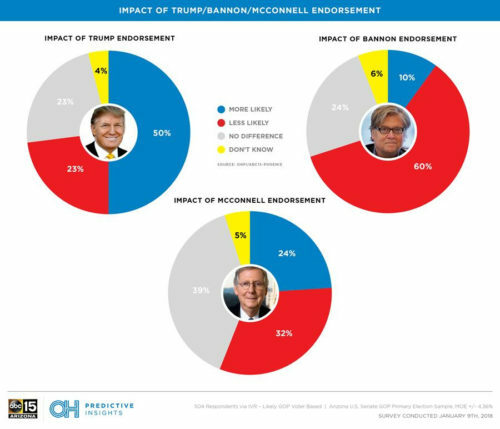 Steve Bannon’s endorsement on the other hand moves 70% of voters and that direction is straight into the ground. Finally, we wanted to try the horse race question again, but this time inject the primary backers of each candidate. Ward has been endorsed by Bannon. Trump pardoned Arpaio and he was his first major endorsement in the GOP presidential primary. McSally is one of Mitch McConnell’s top recruits for Senate. Methodology: This automated survey was completed by OH Predictive Insights on January 9th, 2018, from a likely 2018 GOP Primary Election voter sample. The sample demographics accurately reflected party affiliation, geographic location, and gender, however, age leaned heavily towards 55+ respondent’s due to the survey medium. The margin of error is of ± 4.36%. Note: Average age of those who voted a Republican ballot in the 2014 election in Arizona was 65. Depending on your source, Steve Bannon was fired, resigned or was forced out of his senior White House adviser position on Friday. 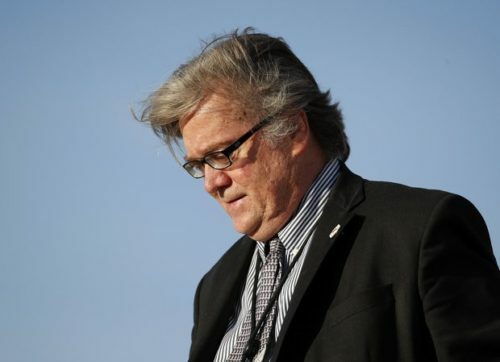 In his departure, Bannon made a statement stating the Trump Presidency was essentially over blaming “the Establishment” for the President’s failure. Mercer recently donated $300,000 to a political action committee supporting Kelli Ward. Those political ads are already airing in Arizona attacking Senator Jeff Flake and blaming John McCain for the failure to repeal Obamacare. Bannon has already returned to Breitbart headquarters to marshall forces for the “WAR” effort against establishment Republicans. Expect those efforts to target Jeff Flake and John McCain here in Arizona. Bannon is one of several high-level Trump staffers to depart the White House in less than a year.